Please do read and share this with an open mind and heart. Imagine yourself, as Muslim, in the shoes of this Sister and see a new, intense reality unfold. It may just change your perspective and inspire you to look deeper and set goals that go beyond this world and realm, Insha’Allah. I have written a small opinion piece to go along with this article, please find it below. Nor do I ever want to be seen as an equal in the eyes of the colonizer. And I never want to be seen as “successful” within colonial systems. It started when I was young. It was lurking in the beginning stages of public speaking, of meeting with ministers, of being groomed in this space of false indigeniety to achieve colonial success. But the greatness I thought I was destined for was only colonial greatness. Because to be equal to the colonizer means to also accept the continued acts of genocide against indigenous peoples. To be equal to the colonizer means to laugh at racism, and to allow and to comply to behaviours that are outright harmful to indigenous peoples and their homelands everyday. It meant laughing uncomfortably at the jokes colonialism makes against your people in meeting rooms. “Oh but not you, you’re different than them.” They will often state that after making a racist joke. Being seen as an “equal” to the colonizer as an Indigenous women means not reporting the rapists to the police because you would rather not cause more trouble and do not want to be seen as the problem in colonial justice systems. Being seen as an “equal” to the colonizer means not reporting the sexual harassment from the boss in colonial workplaces for fear of being reprimanded and furthermore losing one’s place on the corporate ladder. Because “equality” beats self-worth at the time. And that job is your “dream job.” So stay quiet. It comes with the belief that Indigenous people can’t work on their traumas so ultimately, white people are the ones who will give you the life you crave. It is these beliefs, values, and norms that are fuelling the colonial fire of success, where indigenous truth and authenticity burns and dissolves into nothing, all in the name of being seen as as “equal” to the colonial dictators that make up one’s ego. Colonial systems attempt to rob the ideas around indigenous livelihoods being fundamental in a person’s life and rather reformulates them into ideas of colonial success being the only route in early childhood. Colonial systems also leave out the truth of what it takes for an Indigenous person to be “successful” in colonial systems. They leave out the fact that one must accommodate and advocate for colonialism, even if it means building a pipeline through one’s homelands without consent from one’s nation, if they want to be successful in colonial systems. They leave out the fact that if you are an indigenous women, you will be tokenized and violently sexualized on the daily in your colonially successful job, and you cannot say a word of it or else you will be let go. They leave out the fact that you must turn a blind eye to every suicide crisis, housing crisis, drinking water crisis, and health cruces related to indigenous peoples, caused by that same colonial system. Because if you want to climb the ladders of colonial success, the very same ladders of colonial success that are built from the bones of our ancestors, then silence is your best friend. But hey, at least you’re successful! You will have a great job, with great pay, pension, and benefits. You will be having fancy dinners in fancy hotels. And every day, you will be reminded just how racist colonial systems, and the people who run them, are. And this is where it comes down to making a decision, that life changing decision. This decision-making process can be taught to our children at young ages. The younger we teach children not to comply and cater to colonial versions of success and equality, the younger our children will untangle themselves from the traps of colonial success and equality. 25, like I was doing. Because, as soon as a child enters the doors of a school, it is there they are taught that the only way they will be successful in life is if they get an education and get a career. It is the only way they will make a living and support themselves. Colonial educations systems strive to feed and maintain this narrative. The belief that living on the land and on the Rez won’t get you anywhere exists so deeply in these systems that Land-based practices are seen as “field trips” and once a year activities. A week long culture camp for students is great, however, it teaches children that there has to be a special time slot put aside for Land-based practices and that learning how to be successful within Indigenous systems is a “special” activity, rather than an every-day norm. So how do we dissolve these ideas? How do we teach children, and ourselves as adults, to strive to be successful within indigenous systems? How do we teach children, and ourselves as adults, that the only equality we need to strive for is an equality amongst our own people, so we can realign with a non-hierarchical form of indigenous kinship systems? Read more… Please visit this link for the rest of this article, Insha’Allah. A friend shared this blog recently on Facebook. I was floored with the emotions that it brought up and how everything that is written spoke to me as a practicing Muslim woman who comes from a people who were colonized and continue to be occupied physically, emotionally, and mentally to this day. I was born in Canada to immigrant parents who were babies when their colonizers left their countries after generations of rule, well, physically (this isn’t true for the colonizers of the Indigenous people of North America). My Mom and Dad grew up in a generation that wanted freedom and success, but defined it with the colonizer’s dictionary. They got rid of the British Empire, but kept their elitist sentiments and system. A perfect example of this is Sind Club in Karachi, Pakistan (a country club for the wealthy), which used to have a plaque at it’s entrance that read: “No Dogs and No Natives Allowed” when the Empire ruled. This building and it’s history are a physical manifestation of the grief and pain of our people, yet while the majority of the country lives in poverty, its looming walls have become a symbol of wealth, power, “blue blood”, and the elite who rule Pakistan with the same grip of control, corruption, and hierarchy that the Empire shamelessly exhibited. The only thing that has changed is the colour of the skin of these men. “Natives” are still not allowed and gather no benefit from its existence except to feel powerless, oppressed, and defeated. This is just one such example of how we have adopted the ideals of our colonizers, but there are thousands more across the Muslim world and beyond, Subhan’Allah. Islam has a system and it has an idea of freedom that breaks the chains of slavery to an imperfect master of flesh and blood. It asks us to worship and obey the Creator of the Heavens and the Earth. It asks us to rise above conditioning, societal pressure, pain, and prejudice. It tells us to break these mental chains, take a hold of our own lives, and honour ourselves through self love, worship of Allah, and service. For a long time, I tried so hard to be equal to them just like the Indigenous Sister in this blog. I know now that I lived the generational trauma of my colonized ancestors and the resulting break down of our spirits, faith, and nations. I realize now that our hearts and minds remain colonized and this was their goal. They didn’t only want to physically colonize us, it is far less work to traumatize us and make us forget who we were before they ever got there. That’s true control and they continue to control us, except that now we go willingly and unassumingly. They left our countries in such a state of disarray and dependence, that we could not adapt and find our own way. We didn’t even know who we were without them, our way of life long forgotten, so we chased after them and sought refuge with the very people who enslaved us. We moved to their countries, willingly enslaving ourselves, and continued to build their empires, while abandoning our own people and lands, where Islam all but disappeared into some skewed rituals, ancestor worship, and limited to oaths and promises not intended to be kept, Subhan’Allah. So, I blindly measured my success by their values, praise, and acceptance as well as my misplaced gratitude and feelings of inferiority. I tried to strive in that environment and measured my success by how many awards I was granted, how many times I was “recognized”, or how I impressed them with how “white” I sounded when I spoke. Now, I realize that in many of those scenarios I was the “token” brown girl, who was being paraded around like a flag of equality and to hide their oftentimes deep-rooted racism and inherent privilege. I tried to belong by doing what they expected, bending my faith until it reached its breaking point, and ignoring their derogatory remarks, but was never able to truly win them or be their equal. My reflection and my Creator just wouldn’t allow it. I would rather not give them that power or recognition, even if they are just as lost as I was. Upon coming closer to Islam, I discovered that this feeling of unease was a blessing and I could never truly just belong. As Muslims, we have our own beliefs, our own Faith, our own way of life, our own system that does not discriminate, and we have been tossing that aside for far too long. Nothing is superior to Allah and His Commandments and Expectations. Nothing. Yet, we work harder at getting the approval of these men and women than Allah and it is this realization that fills me with shame and a sadness that can be hard to overcome some days. I am especially ashamed at the fact that we are more loyal to these countries than our own Brothers and Sisters suffering across the world. They suffer, because of the very policies, pillaging of natural resources, and continued wars waged by the West we so love and covet. I am convinced that we cannot and consciously should not “Islamisize”, find unfounded similarities with, or attempt to better the settler system by protests and petitions (efforts we didn’t make to better our own countries), because we desire to live and thrive here. It is a dangerous line to tread and can lead to ignorance, hypocrisy, and disbelief, Subhan’Allah. Realizing this and our own impediments when it came to Islam, we have chosen to homeschool our children to teach them about their Creator, about our way of life, and the unfiltered history of this world. We are taking our narrative back and we will not let anyone tell us our story and the realities of life through a biased and self-serving worldview. We have to stop making our children “part-time” Muslims or expecting them to become examples for others. They are children and should not be expected to do such a thing, because most times their resolve can be shaken in the quest to belong, so that they only follow or share their faith or values when it is convenient and politically correct to do so or not at all. This can be extremely uncomfortable and difficult as an adult, imagine how tough it is on these children. Kids are very perceptive in how they interact with us and their peers. They can be reserved to the point where we cannot even detect these pressures until it’s far too late, Subhan’Allah. Really, we must ask ourselves, how much our kids are exposed to the mainstream and how much to Islam? Is Islam as easy for them to understand? As interesting? Is Islam a set of rituals they perform, but don’t really believe in? What does it mean to us? The image of sending kids to nature camps once a year or special activities to understand the Indigenous way of life that the author of the article illustrated really spoke to me, because we do the exact same thing as Muslim parents. Sunday School once a week, weeklong Masjid Summer Camps, or a Jumu’ah here and there when they are young is our happy norm, but even that slows down and eventually stops once our kids get older and have too much schoolwork and activities. We actually push them towards the world and it’s attractions making excuses for them and then wonder what went wrong later in life when they disrespect us or abandon us and eventually Allah when dunya really begins to not so subtly dictate what they should and should not believe, Subhan’Allah. True success is not what everybody else is after and it will not come from striving for ideals that were bred out of skewed settler philosophies, supremacy, and genocide. Even if the world puts these values on a pedestal, justifies them, unites on them, judges every being by their standards, and fights whoever doesn’t comply, we will not surrender. Our beliefs ask us to find our success and balance in our Creator, His Law, and to the service of mankind, but only as He wants and dictates. We cannot put the Allah “spin” on whatever act we like and attempt to inject Islam with our loose interpretations into it somehow for a few small victories, because of our own flawed thinking and desires. We are asked to strive for greater victories and do justice to all of God’s Creation, not just a select few with certain shades of skin, certain accents, who live in the “right” hemisphere, or who have the most power or reach. I don’t want my children to think that they are any less, to tolerate intolerance even if it is disguised in beautiful and beguiling packages, or believe that they have to fit into some superficial mold made to keep them controlled, occupied, and asleep. I don’t want them to be tethered to a leash that someone else holds, letting them loose for the sake of a taste of exotic culture, but pulling back whenever they step out of line and get “too Muslim”. I want them to be aware of their background, their faith, and, yes, even their privileges, so that they can make better choices and bring the Rule of their Creator into their hearts, homes, and eventually the world. This is the true calling of the Muslims, one forgotten and lost to the beauty and enticement of this world for far too long. I read this with my children and discussed the rhetoric in detail. Please do this with your children as well, Insha’Allah. Most of us spend so much time preparing our children for success in the worldly life. We find validation in this success, as if them becoming the Prime Minister of Canada, as the Sister illustrated in the post, will somehow change our condition or make us equal to them. We sacrifice, we have sleepless nights over our children and their future, we make ourselves incredibly uncomfortable for their worldly success, but do not give Allah or Islam the same honour. Why? Why are we not as uncomfortable over the state of the Ummah and the fact that Allah is not worshipped as He should be? Why is it that we claim that He is our Master, bow to Him, yet always put Him and His Commands second to our desires and the the expectations of mere people? Isn’t it time to build for something that will last and transcend this time and space? Isn’t it time to give that honour and sacrifice for Allah? When a people want to achieve something, if they truly believe in it, they do not look for instant results and gratification, they work patiently for generations and pass their dreams, goals, and their passion to their children, who then bear the torch and keep running towards bringing them to fruition no matter what. Many countries, nations, and even companies that exist today came into existence on account of this philosophy. Our history also illustrates this, so why are we not working towards this? Why can we not have our own safe space and our own system? How long will we continue to go with the flow and depend on the scraps of others to sustain us? Why can we not strive for Madina? We can and we should. It all begins with an idea and a voice. Allah and His Messenger SAW have given us this! But, where have our voices gone? I know, for many of us, this change may be difficult and we may never see a true Muslim land or leader, but we can sow these seeds in our children and hope that they flourish in the generations to come under the guidance of Allah, who promises victory to those who truly strive in His Cause. The irony of my words isn’t lost on me. I know there are some who are reading this and rolling their eyes. They’re thinking, “well, if she doesn’t like it here, she should go home.” This is a strange reaction, indeed. I used to have the same one. Not anymore. We have no home. We have no where we can truly call home on this earth, because there is no Rule of Allah on this earth, Subhan’Allah. Until there is, we are wanderers, strangers, looking for home. Honestly, I am not trying to wax poetic. Whether we live in Canada, the US, Europe, Saudia Arabia, Pakistan, India, China, Australia, or Abbysinia, we will never feel settled until we are in a place that can truly be called a Muslim Land as defined by Allah and His Messenger SAW. This is our Mission and it is what we should motivate our children to keep striving for even after we are long gone, Insha’Allah. 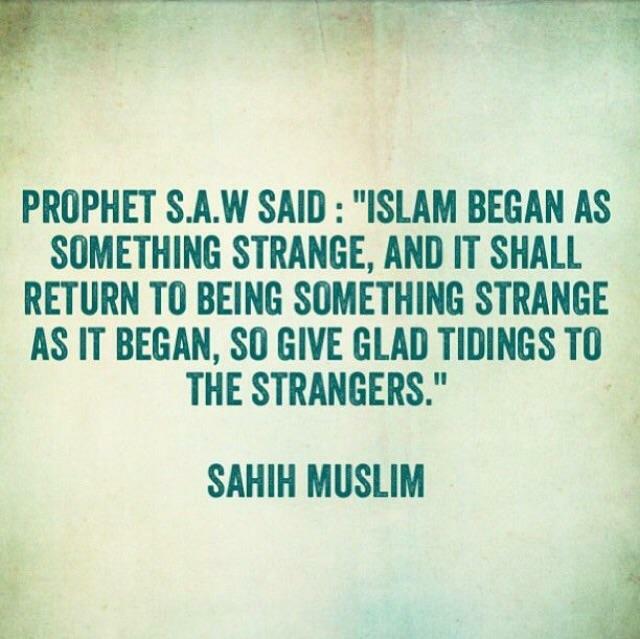 We have come this far…I believe it is a thought worth exploring, Insha’Allah. This entry was posted in Expression, Inspirational, Uncategorized and tagged adverse, adversity, Allah, awake, believer, build, canada, children, city, colonial, colonial system, colonize, colonizer, compassion, courage, daughter, devout, elevate, equality, faith, God, hate, indigenous, Islam, justice, love, mother, Muhammad (PBUH), muslim women, Muslims, nation, natural, peace, priminster, privilege, racism, religion, rez, rise, sacrifice, slandering, steadfast, truth, ummah, wake up. Bookmark the permalink.